Why is Pacquiao being matched against so many faded fighters? By Sean Anderson: Manny Pacquiao has quite literally been considered a phenomenon since breezing through the boxing weights, beginning his career at flyweight in February 1996. Between 1996 and 2008 Pacquiao won world titles at Flyweight, Super-Bantamweight, Super Featherweight and Lightweight. This period saw him beat Mexican Legends Marco Antonio Barrera and Erik Morales in clinical fashion. He also drew with, and gained a contentious victory against another Mexican master in Juan Manual Marquez. Pacquiao gained massive plaudits for this success. However it was not until his victory over an aged Oscar de la Hoya (another Mexican!) in December 2008 that he gained worldwide recognition. By this time De La Hoya was 35, and being ask to fight at a weight 8lbs lower than his previous bout. As a result he was considered ‘dead’ at the weight and the future “Hall of Famer” quit on his stall after eight rounds. Pacquiao then sought a World Title at a fifth different weight when taking on Britain’s beloved Ricky Hatton five months later. 18 months previously Hatton had been dismantled by Floyd Mayweather before showing worrying signs of diminishing punch resistance against the lightly regarded Juan Lazcano. From this it was obvious Hatton was on the wane and he was knocked out in three devastating rounds by Pacquiao. Only 6 months later Pacquiao moved on to Miguel Cotto, the well regarded Puerto Rican who the year previously had been stopped in brutal fashion by Antonio Margarito. Pacquiao won this WBO welterweight title fight with another stoppage to win a world title at a sixth weight. Ironically Pacquiao then defended this title against the durable Ghanaian Joshua Clottey, who in his previous fight had lost to Cotto. Pacquiao won a lopsided points decision. This was followed by a bid at a world title at a seventh different weight against the slayer of Miguel Cotto, Antonio Margarito. Margarito had recently returned from a ban for using illegal substances in his gloves, and was knocked out by American ‘Sugar’ Shane Mosley in his last world title fight. Pacquiao out pointed Margarito convincingly, leaving the Mexican battered and bruised. This up to now is the end of Pacquiao’s journey through the boxing weights. He did however step down to regain the WBO welterweight title against Mosley via points decision. It may not surprise you to hear that Mosley lost to Mayweather a year prior. In Pacquiao’s most recent fight to date he fought his old foe Marquez for the third time in May 2011. Marquez had lost to Mayweather in conclusive fashion in 2009, and it was thought that he was on the slide and that Pacquiao would make short work of him. This was not the case and for the second time a contentious points decision went in Pacquiao’s favour. In review, Pacquiao has had seven fights since December 2008, and each and every one of these opponents has taken some kind of beating in their previous four fights, four of them by Floyd Mayweather! Some fighters had merely had tune up bouts between losing and taking on Pacquiao. It cannot be denied that Pacquiao has some incredible names on his CV but whether any of his opponents since 2008 were in any kind of prime is questionable. 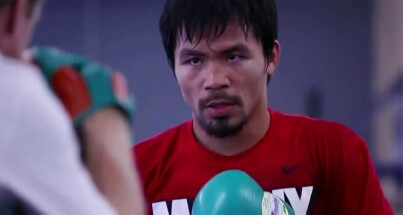 Boxing » Manny Pacquiao » Why is Pacquiao being matched against so many faded fighters?